That is how Edward Bunker, in his book Education of a Felon, described the way a fellow prisoner used to illegally heat his water in the Los Angeles county jail in the 1950s. 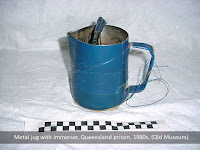 Kettles and heaters were also not allowed in the Boggo Road cells, but a number of objects in the Boggo Road Gaol Museum collection show that some thirsty inmates managed to get around this problem. As with improvised tattoo machines, it usually involved a bit of imagination and scrounging various items from around the everyday prison environment. 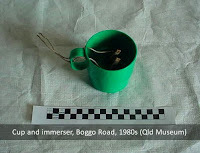 The plastic cup shown in image A (above) was found in a Boggo Road kitchen and adapted to work as a mini-kettle. It contains an immerser constructed from matchsticks, electrical wiring, cotton thread and a razor blade. The wiring would have been attached to a power source such as a light socket. The metal jug in image B, confiscated from a Queensland prisoner, was adapted in a similar way. 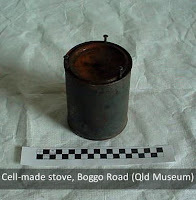 Like the one described by Bunker, non-electric stoves were a bit simpler and could be made from a couple of empty tins, a few screws, and a bootlace for a wick. The upper tin sits on the three screws in the lid of the lower tin. The wick was coated in lard, which acted as wax does in a candle. The lard was sneaked out of the prison kitchen and rolled into balls so it could be ‘sold’ to other prisoners. When available, paraffin could also be used. The stove in images C and D was made from an old coffee tin and used in Boggo Road during the 1980s.